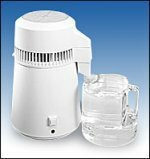 This compact countertop distiller produces a 1 gallon batch of clean, pure water in just 4 hours! Providing enough water for up to 4 people, the 4000 requires no assembly or installation and is as easy to use as a coffee maker. Simplicity by design makes the 4000 simple in operation! Just fill the stainless steel boiler with ordinary tap water and plug into any standard electrical outlet. Then push the start button and walk away. The 4000 stops automatically when the cycle is complete. The Distiller 4000 comes with a 1 gallon GE Lexan(r) collector/storage bottle which fits easily inside your refrigerator. For travel convenience, the bottle goes inside the distiller!